Bar Louie a nice classy bar located in the Laurel Park Mall. They have really good food and offer a full bar. They have pretty good drink specials throughout the month. They have great happy hour specials with really cheap drinks. 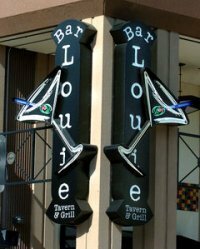 Bar Louie has a nice comfortable outdoor patio if you feel like sitting outside for some drinks. If you're in the mood for the appetizer try the soft pretzels that come with a choice of three dipping sauces. If you're in the mood for a full meal try their three taco meal or the ahi tuna, both are great.